Gifts are wrapped and your flight is booked for special holiday time with family and friends. After choosing the best wine as a hostess gift, you are eager to present it, but how should the bottles be protected during travel? 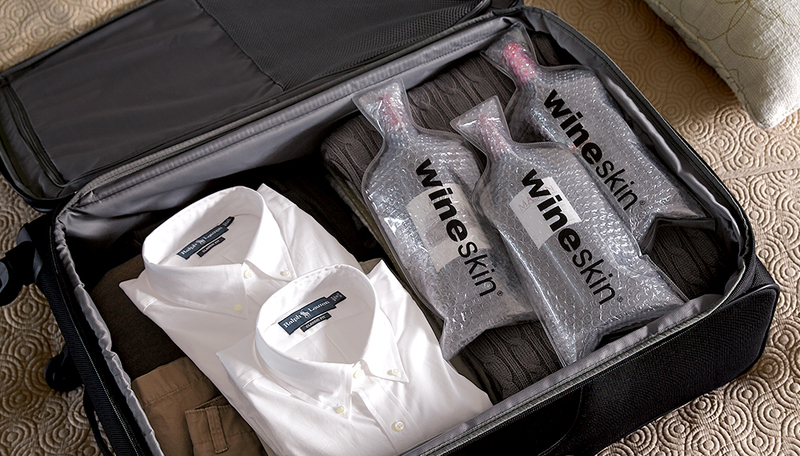 Due to restrictions of 3.4 liquid ounces, wine bottles can no longer be placed in carry-on luggage. The TSA will remove them, risking the entire loss of your selected wine, as there are generally no options to ship delicate items such as wine bottles home once entering the security checkpoint. All wine falls within the category of under 24% alcohol, which is unrestricted in the United States. Higher percentages, such as whisky, vodka and gin are limited to 5 liters in checked baggage, and anything over 70% is not allowed on board. Because luggage compartments are pressurized, there is little risk of bottles uncorking, and sparkling wines will travel well provided the bottle has not been compromised prior to packing. There may be overweight baggage fees associated with checking bags over 50lb. If bringing a few hand-picked bottles, rather than an entire case of wine, first seal them inside padded WineSkin Bottle Transport Bags, then in a watertight plastic bag for extra protection. Place them in the center of your packed suitcase, surrounded by soft clothing items. Use a hard shell suitcase, such as the Vingarde Valise due to common mishandling of luggage at airports. For wine aficionados who wish to present an entire case of wine, use the TSA approved Wine Check to pack in a padded suitcase. Airlines occasionally offer a free case of wine checked with your flight, such as the Charles M. Schulz Airport for the Sonoma and Napa wine country, or Oregon Wines Fly Free. Different states and airlines may have additional regulations. Always check the regulations of the location you are traveling to, for example Utah and Alabama have strict regulations regarding imported alcohol of any volume. Duty-free depends wildly on the country; since the duty is usually $1-2 per bottle, it is often waived entirely. Within the European Union, plan for up to 90L before duty, New Zealand at 4.5L, Switzerland 5L and back into the United States up to 1L. Check with the destination country and province (especially in Canada) before travelling. 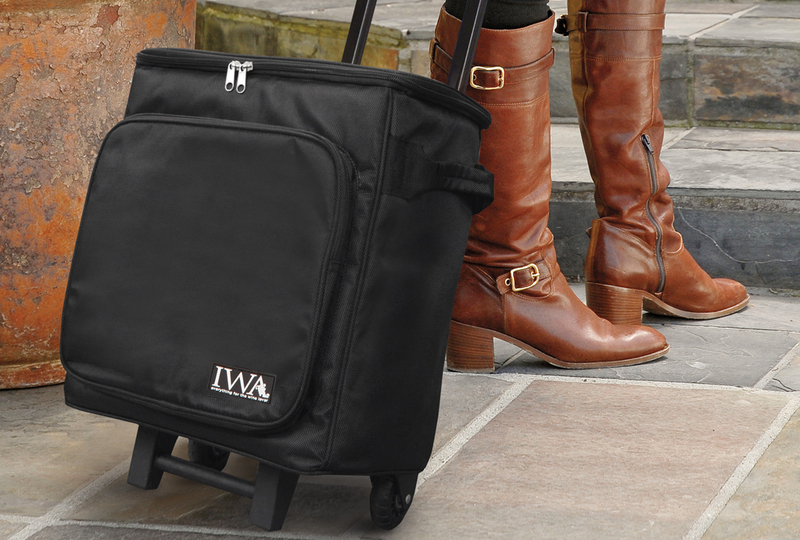 If your loved ones are within driving distance, consider a rolling wine trolley, sturdy hard shell WineKaddy or for choice bottles, our leather wine tote. If planning on gifting a single bottle, try our festive Holiday Gift Tags or a jolly Sleigh Cork Cage Gift Tag that doubles as a tree ornament. Silicone Bottle Stoppers are handy to keep an open bottle fresh, and our Aermate Aerator is a simple and compact tool to bring out the flavor of red wines. There is always room in your suitcase for a set of wine openers, such as the Le Creuset Foil Cutter and Rabbit Zippity Corkscrew two-step corkscrew. If you are unsure of glassware at the final destination, or plan on staying in a hotel and opening a bottle of wine, bring a set of durable Italesse Polycristal Glasses. They make great gifts, too!